Last week, Toby and Tassos led a Coney Masterclass in making interactive theatre for, by & with young people. It was a brilliant three days working and playing with a group of fifteen artists and makers, each one bringing a different set of superpowers along the way. Rather than tell you about it ourselves, here’s one attendee’s insights into their experience of the Masterclass. About a year ago I came upon interactive theatre exploring the question of whether, put in the shoes of the 1%, we would make the same decisions that led to the financial crisis. This form of theatre intrigued me, especially because the audience, or the participants, could not stop talking about it long after. Since then, I have been on a journey across countries exploring interactive and immersive theatre, which one day led me to Coney’s Masterclass. Over the course of the three days, I discovered the joy of playing games along with 14 other adults. This joy helped to incubate creativity, curiosity and collaboration amongst us. What is brilliant about Coney’s approach is that no interactive game was ‘taught’ but instead ‘played.’ This way we all delved into our own imagined characters as we played the games, and more importantly, perceived the game from the point of view of the participant rather than the creator of the game. This is an especially crucial point when it comes to creating interactive theatre. I got a glimpse into the creative process and learned that often characters and plots can be built in a spontaneous manner when we let people be free and rely more on intuition. 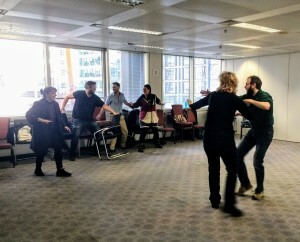 One of the special gifts from the Masterclass was not only the new insight into making interactive theatre, but the friendships that resulted from being all in one space with the framework introduced from day 1: “Be Brave. Be Kind. And Be Yourself.” By the end of day 3, we felt more like a family. It was so fascinating to see that people coming from so many different backgrounds, perspectives, geographies, disciplines and experiences, could bond in the spirit of making theatre. To me that is the magic behind theatre – it brings people together, not only to see it and be part of it, but also to make it. Going forward, I would like to use the same collaborative approach in creating my own interactive theatre by bringing people together to discover the joys in imagining, creating and playing. If you’re an artist or maker interested in future Masterclasses, or free events like our Exchanges where you can share work and feedback, join our Network here – we can’t wait to meet you!